It was a snowy afternoon at the end of a pleasant January thaw. Our front deck, which my wife shovelled so diligently when the snow was heavy, prior to any thoughts of a thaw, was now accumulating a fresh couple of inches of snow. 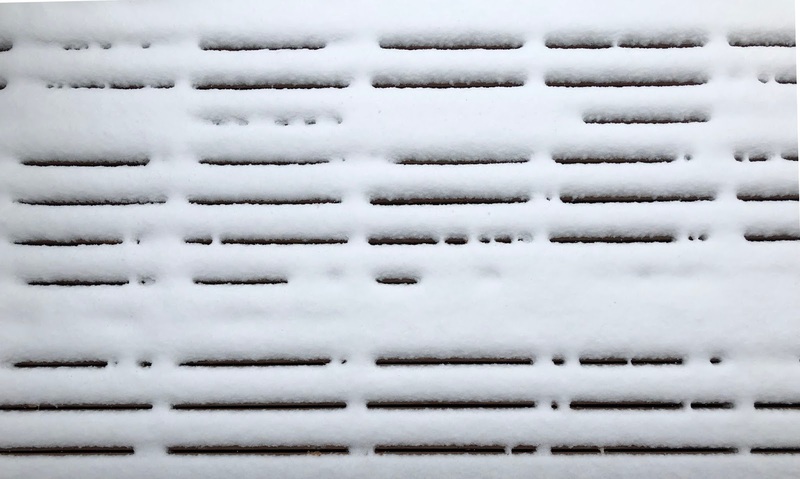 Our heat pump is under the deck, so there's a certain amount of melt that always happens, making nifty little patterns through the boards, and that's exactly what happened this time. So, I grabbed my new phone (yes, phone. I'm seeing what it does—good little camera for a phone) and took a picture. I was struck by how much it looked like highlighted columnar text. I set about finding the right text for it, eventually remembering an old piece I'd written about the photos of real life moments. We all smile in photos. Especially back before digital, when it cost a lot to develop pictures that came days later, when the moment couldn't be re-shot so easily. All those smiling photos, marking occasions and even otherwise random times, made it seem like our lives were a series of gleeful moments strung together. The story was about a woman who proudly displayed those other photos (it was titled "Those Other Photos") in her home. And the photos depicted her sexual journey, some of which was painful. I've only shown it to a handful of people. They were all made uncomfortable by it (I thus learned why all our photos are filled with smiles). 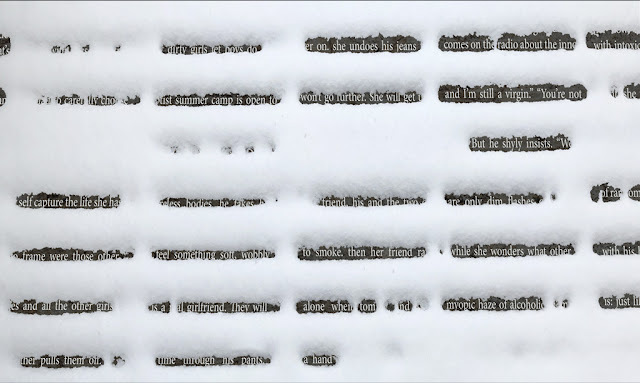 This new photo, with my snowy redaction, is my response to those readers and the world, I guess. The words are light, like the snow. The depths are dark and a little rough. Little FYI, the whole text is there in the photo, but the snow's highlight burns the detail all away.